In addition to being a partner to Paralympics Ireland, Toyota Ireland has been named an official supplier to the 2018 World Para Swimming Championships, which take place in Dublin from August 13th to 19th. Ahead of the 2018 championships, the company has handed over a fleet of seven cars to Team Ireland, a move that cements the company's partnership with Paralympics Ireland and the Irish Paralympian movement, as Toyota is also partnered with the 2020 and 2024 Irish Paralympic teams. The 2018 Championship is the biggest Paralympian event to ever take place in Ireland and the largest Para Swimming event in the world in 2018. Ireland is well represented with, among its athletes, Toyota's brand ambassadors Ellen Keane and Nicole Turner hoping to reach the podium. Over 400 athletes representing 37 countries will compete at the event, which is expected to attract thousands of spectators. According to the company: "Toyota's ambition for the partnership is to promote a more inclusive society, help break down barriers to mobility, boost the profile of Paralympics, and ultimately create a lasting legacy for Paralympic sports in Ireland. This is very much representative of Toyota's Built for a Better World brand proposition and its vision to create a meaningful difference for the people of Ireland." 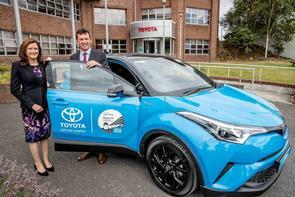 In response to Toyota's handover of the seven cars to Team Ireland, Miriam Malone, the CEO of Paralympics Ireland, said: "We're thrilled to be collecting the fleet of Toyota cars that will be supporting our team over the coming weeks. With the World Para Swimming Championships just around the corner, there are very exciting times ahead for our athletes and parasports in Ireland, and with the support of Toyota, we'll be aiming to deliver world class, medal winning, performances alongside great memories." The Championships will take place at the National Aquatic Centre in Blanchardstown in Dublin.